Seated at a loom or silhouetted by a panoramic Monument Valley landscape, our most enduring impressions of Navajo women are frozen in time on postcard nostalgia and in coffee table books. In this modernized representation of Navajo women-seen through the lens of Diné photographer LeRoy DeJolie-the resulting portraits reveal the evolution of traditional apparel that sings the stories of land, history and progress. Whether covered head to toe in velvet, satin or cotton, the dress and manner of Navajo women expresses a modest, quiet dignity. "The Navajo style of dress is a classic design that has held its own over time," says Gallup-based designer Virginia Yazzie-Ballenger. A fashion staple equal to the classic "little black dress," the fluted broom skirt and velveteen blouse has transcended the kitsch of the '50s era "squaw dress" and the glamorized "Santa Fe Style" made popular in the '80s. No longer considered costumes, the Navajo skirt and blouse-worn with pumps, cowboy boots or moccasins-has come to epitomize the spirit of Western femininity. However romanticized, the origins of this Western spirit can be attributed to adverse turns in Native American history. Throughout the Spanish conflicts and continuing until the late 19th century, Navajo dress consisted of the Pueblo-influenced biil. This two-paneled woven dress fastened at the shoulders, utilized slits for the arms and head and was cinched at the waist. The 1860s, fraught with Western expansion and subsequent Navajo resistance, delivered an assault on the Navajo way of life. A campaign to subdue the Navajo-which included the destruction of homes, crops and livestock-culminated in forced captivity at Fort Sumner, New Mexico. During this four-year period of internment, it is reported that Navajo women who had been taken as servants were taught to sew by their mistresses. Upon their release in 1868 and the establishment of the Navajo Reservation, the indomitable forces of industry and commerce forged the future of the Diné, via the trading post and railroad. By the 1880s, sewing machines, steel needles and colorful calicos, wools and velvets were more readily available and much sought after. Navajo women adopted the Victorian standard of dress-high collars, fitted sleeves, and full skirts-to suit their restored matriarchal role as caretaker, sheep-tender and landowner. Navajo women constructed tiered skirts from square fabric panels, crafted shirts with collars and mastered fancier tailoring known as "tucking." Later garment embellishments included adorning rows of silver buttons and coins. More than a century later, this Navajo style has set a standard that has deviated very little, yet has been elevated to sophisticated levels that parallel the achievements of contemporary Native women. In the professional arena, Native women can claim powerful roles in the fields of medicine, law, business, education and politics, and still express their cultural identity and values through dress. 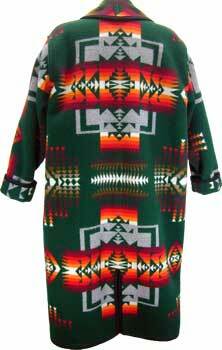 Contrasting the strict seasonal dictates of European fashion trends, Navajo style can be defined as fashion for all seasons. The Navajo garment industry has evolved from market stalls to clothing boutiques. Navajo women are now fashion designers in their own right. Margaret Wood, a doyenne of Native fashion and textiles for more than 20 years, successfully merges Native fashion and fine art through her works in wearable art and quilts. Renowned for her modern adaptations of traditional garments, a demand for her clothing designs led her to found her own company, Native American Fashions, Inc., and to publish Native American Fashion: Modern Adaptations of Traditional Designs (Van Nostrand), now in its second edition. Virginia Yazzie-Ballenger is a prize-winning fashion designer whose specialty is creating sumptuous traditional works in velvet. Like Wood, Yazzie-Ballenger enjoys the challenge of creating new designs from historical garments. Having held several titles as Indian royalty, including Miss Indian New Mexico, Virginia was encouraged by her mother to create her own pageant garments. After entering the work force, she began to design her own clothes out of the frustration of not being able to find clothes that expressed her Native heritage. In between raising children and filling custom orders, Virginia's business has extended beyond a thriving mail-order enterprise. She recently celebrated the opening of a retail store, Navajo Spirit, in downtown Gallup, New Mexico. Arising from a renewed craze for Native-influenced Western wear, new takes of Navajo fashion include unique variations in fabrics, textures, color palettes and tailoring. Wood's work, most recently on view at the Heard Museum's Fashion Fusion exhibition, makes a strong statement that balances innovative adaptations and clothing heritage preservation. Bessie Yellowhair's creations exercise the same approach with apparel that pays homage to outstanding women leaders of the Navajo Nation, such as former First Lady Wanda MacDonald and Big Mountain land activists. From Yazzie-Ballenger, look for a new line of children's apparel, as well as a collection of bridal wear that can be worn in church ceremonies as well as traditional Navajo weddings. Linda R. Martin is Associate Editor of Native Peoples Magazine. Formerly, she was Communications Director of Atlatl, Inc., a national service organization for Native American arts, whose mission is to promote the vitality of contemporary Native American art through self-determination. Leroy DeJolie is a Navajo photographer renowned for his portraits of the land and people of the Navajo Nation. Widely published and exhibited, his award-winning nature and landscape work has appeared in Native Peoples, Arizona Highways, New Mexico, the Washington Post, and Time-Life Books to name a few. His limited-edition prints are represented by the Heard Museum. Obtained through the lens of his 4 x 5 Wista Wood field camera, DeJolie's works, "are the memories, traditions and images that I am compelled to capture and preserve for my children, for my people, and the world for generations to come." Photographed at the Heard Museum, Phoenix, Arizona. Jewelry and accessories courtesy of the Heard Museum. Camille Nighthorse Gordon, Navajo, (left) is a print model and film actor whose credits include "Lethal Weapon 4," "Fear and Loathing in Las Vegas," and "Mars Attacks." A model since the age of 16, Gordon has also studied theatre, dance and voice at Brigham Young University, and is President of All Natives Talent in Mesa, Arizona. Charmaine Rae Jackson, Navajo, (right) is a print model, stage and film actor and mass communications professional whose media credits include NBC's "Law and Order" and "Rio Shannon," TNT's "The Lazurus Man," and "Fox Kids Club." She holds a B.A. in Broadcast Journalism from the University of New Mexico, and is currently Vice President and Sales Manager of the Native Allure Calendar Company.